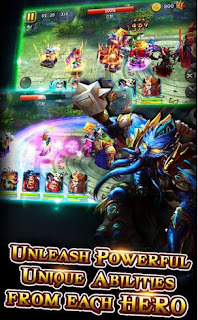 Heroes of Titans is a hero collecting and battling action RPG for Android by Gameview. It's a brand new card battler with gorgeous graphics, hundreds of cards, and a simple fighting system. Since cards are the main focus in this game, players try to collect the best ones, and fight each other to become the best. Each hero in each card can be trained and evolved for maximum power and skills. There is an in-game shop from which you can buy upgrades and items using real money to make your heroes even more powerful. Have fun in defeating your enemies! Install Normal APK, copy data in Android/obb/ and play until tutorial levels are over then install MOD apk file over installed normal one and play.